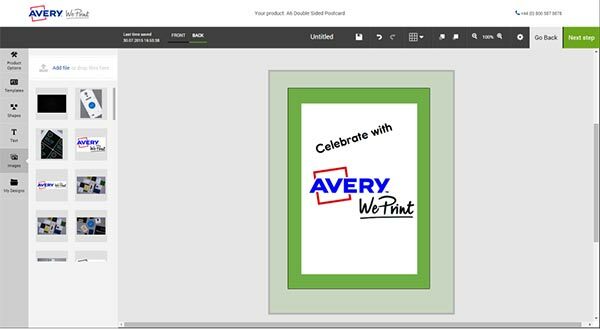 After months and months of hard work, late nights and cups of coffee, Avery WePrint is live! We're very proud of our final product. From the new high quality materials used for our printing, to our incredibly posh HP Indigo digital printer in our Northampton factory to our WePrint team, we've made sure that every part of WePrint is the best for you, our customers. 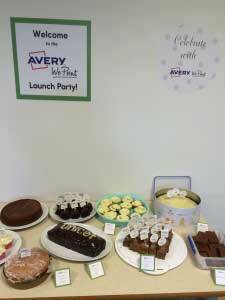 To celebrate, we held a big launch party at Avery headquarters on 7th August. Naturally we used WePrint products to make sure this party was ready to rock! We made sure that we gave back too. 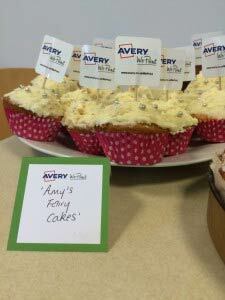 We held a bake sale with all proceeds going to Avery's charity of the quarter: UNICEF & the Nepal Earthquake fund. The products used at this party were: square folded business cards, DL postcards, 40mm round stickers, square stickers, square wall stickers, round wall stickers & A6 postcards. 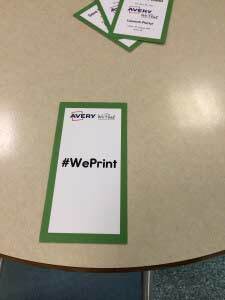 As an employee of Avery WePrint, I made sure the printed materials were ordered and ready to go! Check out the printed materials I created for the launch party below. 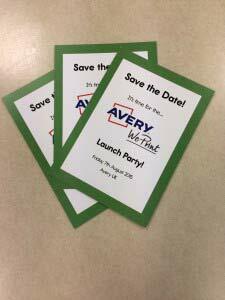 To invite Avery staff to the launch party, we used our A6 double sided postcards. They're big enough to include a nice design and relevant information, but not too big to . We sent them out around a week in advance. 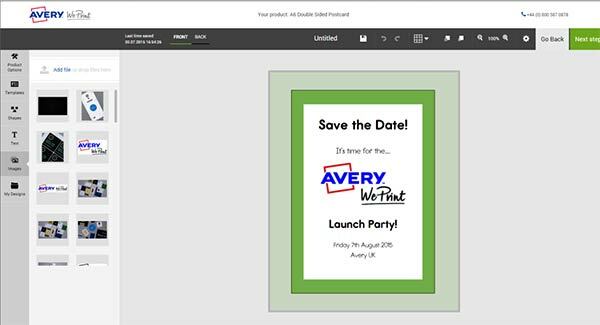 To ensure the Avery office wouldn't forget about the impending launch party, we also sent out event reminders via email (with the mentions of free food!). I used the WePrint the logo as the basis of the design and chose the Report font to make the invite look more exciting. I chose the double sided postcard to make the design feel "complete". I hate it when you've used a double sided postcard for an invitation and not include anything on the back. Look at all of that wasted space! I kept the back of the save-the-date card fairly simple. I replicated the design from the front to avoid over-complicating the design. The final product looked really high quality and worked as a great introduction to the event and the WePrint brand for people in the office. 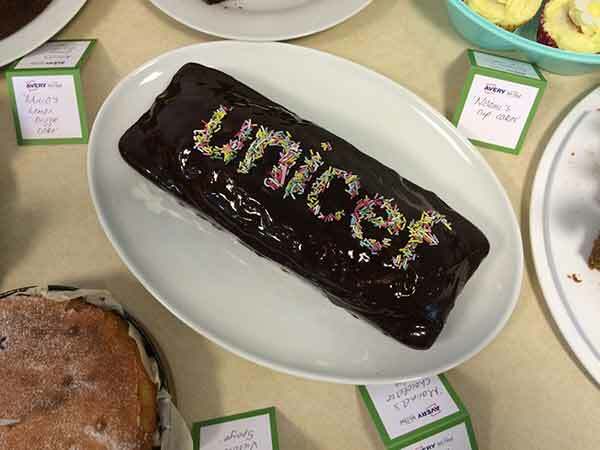 As part of the launch party, we also had a bake sale for our charity of the quarter UNICEF & the Nepal Earthquake Relief Fund. 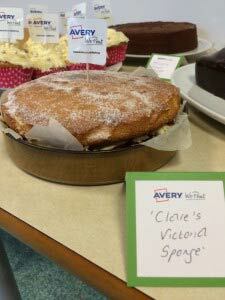 Everyone in the office brought in their latest & greatest creations to make some money for the charity. To showcase the amazing cakes we used the square folded business cards. As we didn't know what cakes were arriving to the day of the cake sale, we hand wrote the name of the cakes onto the square and square folded business cards. We used the same branding on the placecards as the invitations. This made the whole event look professional and cohesive. Our DL postcards work perfectly as Menu cards. Plus with one matt side and one gloss side, you can be sure that your design will pop! Again, we used the same branding across all of the printed materials. The green border & logo were easy designs to replicate using the image function on the designer. Using a hashtag at an event is a good way to measure the engagement of people. Invitees are so much more likely to share pictures and thoughts on social media, and a hashtag is a good way of measuring how shareable your event was. 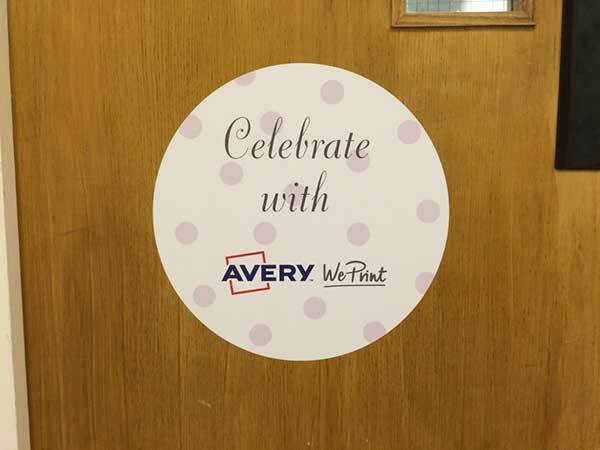 We used the new square wall stickers to showcase the launch party around the Avery office. We created two designs, one showcasing on the WePrint branding, and another inviting the rest of the office to celebrate with us! The two different wall stickers were a way to showcase the different designs you could create with the WePrint designer. I used the round wall sticker as a way to invite people into the launch party, focusing on the "celebrate" element. With the square wall sticker, I chose to repeat the branding that was seen on all of the other printed material. It welcomed people to the launch party. Using a hi-res version of the WePrint logo also allowed for the design to look crisp and high quality. 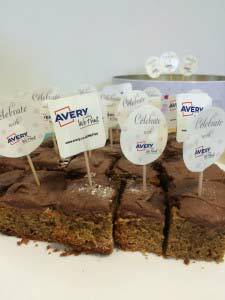 We used square & round stickers as cake toppers for all of the beautiful donations provided by the Avery staff. These cake toppers are really easy to make, using only two stickers & a cocktail stick. We had two different designs for the cake toppers, a square sticker with the Avery WePrint logo and a round sticker replicating the circle wall sticker design. 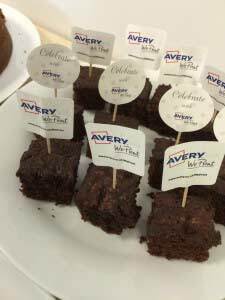 The cake toppers were an easy way to brand the food at the launch party! This is a great idea at an corporate event. People love sweet treats and branding them is a good way of reminding them that you're there and ready to talk! Overall, the WePrint launch party was a success with good food, tasty cakes and making money for charity. It was a great way to celebrate the successful launch and a good way to start off the hard work of making WePrint as successful as possible! And our show-stopper bake? Marina's chocolate & vanilla marble cake! Got any ideas of how to create more printed ideas for events? Comment below and let us know!